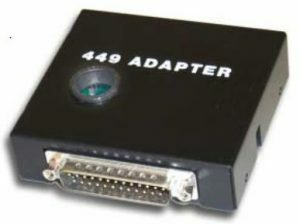 The RS449 Adapter manufactured by Relcomm performs the necessary adjustments between an RS449 interface and an RS232 interface to allow direct connection of both. communications equipment). The Model 387 is fitted with a DB25F connector and a DB37M connector. (data terminal equipment). The Model 487 is fitted with a DB25M connector and a DB37F connector.